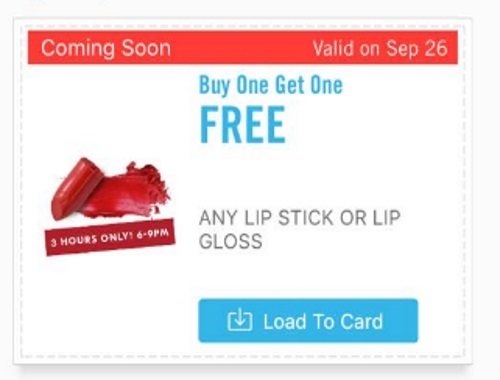 Shoppers Drug Mart has a Flash BOGO Event coming up! Get BOGO any lipstick or lipgloss! When you buy one, get the second one Free! Be sure to load the coupon onto your Optimum card to get the offer in-store! Offer is valid Tuesday, September 26, 2017 between 6-9pm (3 hours only). Offer applies to participating lipstick or lipgloss only, excludes prestige brands! Offer expires after one use and cannot be used on subsequent transactions. Product availability may vary by store. Offer is applicable to one product only. Click here to browse your Shoppers Drug Mart offers.